So… my current iPhone app addiction has a competitor for my attention, Mafia Wars. It’s a Facebook game from the folks at Zynga. The functionality is almost EXACTLY the same as Mafia LIVE. Would be interesting to see who came out first. While this game is awesome, I like that Mafia LIVE is based on the iPhone because then I can play it during the down time that I have that’s not infront of my computer. 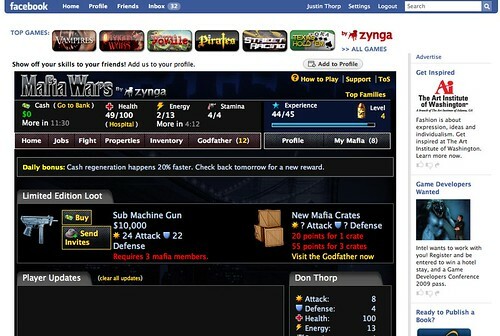 I’d love for Mafia LIVE to take a cue from Mafia Wars and pull Facebook Friends into it when Facebook Connect comes to the iPhone. So which of these Mafia games are you playing? I see that SGN just released a Mafia game for the iPhone. I’m going to review that one next. Posted on February 8, 2009 February 9, 2009 Author Justin ThorpCategories Mafia LIVE! Hey Justin, long time no see. Add me to your Mafia Live! I LOVE MafiaLIVE. I’ll have to try this game. Add me- 123dontspamme @ gmail.com (no spaces) for 10K! Mafia live is very addicting. I’m still not sure why, but I think its because of the mix of complexity and simplicity. Facebook Mafia Wars is by far the best – new secrets and strategies guide coming out soon. Wanna be part of a powerfull and rich family ? Yes. Yes. Nice, Fun, Game. You can get a $10,000 Bonus if you email me at apollowehavetouchdown@yahoo.com under the “Consigliere” Tab in Mafia Live. If you add myself and others it helps you complete Jobs that require a bigger family, and helps you rise in the ranks by being able to take on bigger families. HAD TO RESTART NEED FRIENDS! WILL ACCEPT QUICK! If you are looking for an easy way to get Godfather points. I found it! Check it out. Its free to sign u $6.00 Welcome Survey After Free Registration!p and super easy. add me plss!! !..lvl 137!!!!! !..i need a bigger mafia!!!! Add me… #8400368359, Level 68 – Had to re-start game but daily player !! !